Hi everyone! Hope you guys are having a blessed week so far. Mine is going okay, no complaints whatsoever.. Soo, my blog got another facelift! Yay! Those that know me well knows that I'm all about CHANGE. I get bored easily doing the same things and looking at the same things over and over. And to me Change equals Growth! So, since my blog is growing, I decided that the blog template has to change also. It's now even more simple and clean. This will make it easier for you guys (the readers) to navigate through it. I hope you love the changes just as much as I do..
Sew On Trend is a category I'm adding to my blog for those that love to sew garments that are currently trending. Because we all know that sometimes it's cheaper to sew than to buy. It's also a way to keep myself and you guys inspired by some of my favorite designers. Today's Sew On Trend is featuring the infamous Cape Coat/Blazer that I've seen some of my favorite bloggers worn. 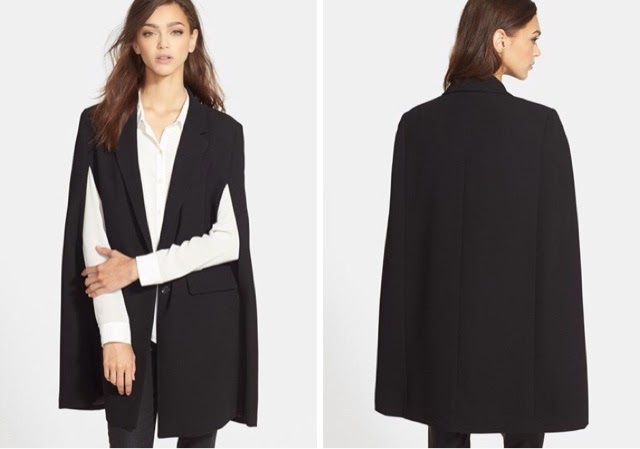 These coats have clean lines and are sleek and able to wear as a day look or evening look. I love them because of how tailored and polished they look. To Sew the Look, check out Vogue Pattern 1322 by DKNY. Pattern Description: Very loose-fitting, lined cape has collar, shoulder pads, princess seams, welt pockets, flaps, side front openings, no side seams, and front button placket closing. Do you have this on your "To-Sew" list? Let me know... Would love to see it. Ooooh I live this new blog category! I love the cape trend and I have thought of making one but this vogue pattern is a bit advanced for me since I am a beginner in sewing. But I would love to see you make one and share a pattern review. I love the "facelift", your blog looks so sleek. I absolutely love capes. Love!